Back in 2006, a small post-punk quartet from Newmarket, Ontario hit the club scene and blew people away with their brilliant live shows. They then released their first album to critical acclaim and became a major Internet buzz band. Tokyo Police Club has returned in 2007 with a short but sweet three song EP that is the follow up to the buzz generating A Lesson in Crime. The Smith EP has two songs that focus on their familiar strengths and signature sounds, while the third is somewhat of a surprise and seemingly not the most pleasant. "Box" is the album opener and it really showcases the familiar bright sounding guitar riffs that everybody loves them for. It will also cause people to bring up the whole "They sound like a better version of The Strokes" talking point. "Cut Cut Paste" is another short and punchy gem, but it is also the most distortion-based song in their short career. The song dips at the chorus and kind of loses it's footing, but regains it when it kicks back into the next verse. 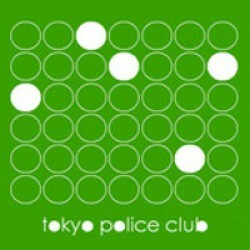 "A Lesson In Crime" is Tokyo Police Club's first attempt at a piano ballad. The song features only lead singer, Dave Monks, and a country saloon-sounding piano. The song just isn't what you'd expect, and it also isn't what you would want, but you have to applaud such a departure from their known sound, even if it isn't as fantastic as you would hope. At least they kept the handclaps in the song. Another EP isn't what fans wanted to hear from Tokyo Police Club, but they will have to settle with it for now. Eventually they will have to put out a full-length album, but until then, I sure hope they keep putting out these little EP's, and I really hope to see them live again. 7.2 / 10 — Ryan K.
Posted June 12, 2007, 7:25 p.m.
Posted May 12, 2018, 11:15 a.m.
Posted Dec. 27, 2014, 1:10 p.m.
Posted July 13, 2014, 9:22 a.m.